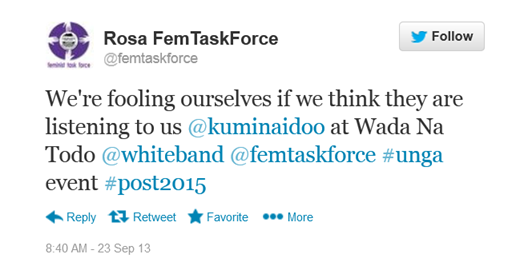 “We’re fooling ourselves if we think they are listening”, the Feminist Task Force on the post-2015 process tweeted on 23rd September, ahead of the United Nations General Assembly. The rhetoric on women’s empowerment has never been glossier. Everyone is now in favour of women’s rights, everyone will adopt gender mainstreaming into their processes, everyone would like to measure the participation of women vis-à-vis men. Empowerment used to have a radical meaning. It used to mean change from the bottom-up, change that required actual shifts in power. But as Sharah Razavi from the UN Research Institute on Social Development points out, the term ‘empowerment’ can be understood very differently depending on who said it. Terms can be appropriated by the international community and voided of their radical content. Empowerment used to be a synonym of emancipation , used almost interchangeably by the UN in the early days of talk of gender and the 1993 Vienna conference on Human Rights. Today, I see empowerment is becoming a synonym of the ‘participation’. Participation is of course understood and being allowed to speak within existing structures and ‘enabled’ to raise a hand in within existing power relations. What is the problem with the cooptation of a term by one powerful community that lacks radical vision? One consequence is in the imagination of development alternatives. When we have no word to mean actual shifts in power, our collective ability to imagine those shifts in power is diminished. The post-2015 process is lacking in creativity, lacking in vision to devise an alternate economic system which inherently supports a decent life for all. We talk in glossy terms, using emotional imaginary and the seductive language of “partnership” to designate the relationship between a CSO working at provincial level in the Democratic Republic of Congo and an oil extraction multinational with shareholders to please. This language is deceptive for those interested in real shifts in power structures. Let’s seriously consider how women are faring. The Millennium Development Goal 5 on reducing maternal deaths by three quarters is not on the track to being met. This is arguably one of the easiest MDGs to meet: the causes of maternal death are well known, prevention methods are widely understood, and 60% of maternal deaths are concentrated in just 10 countries. Compare that with MDGs on “halving extreme poverty” or “developing a global partnership”. MDG 5 should be easy. But the investments required are not being made. At Muskoka in 2009, G8 leaders renewed their commitment to MDG 5. However, when investment falls short, and in 2013 progress towards MDG 5 is labelled as “alarming” by the UN, the glossy rhetoric of “gender empowerment” can only ring false. In terms of financing, AWID’s recent report “Watering the leaves, starving the roots” shows that financing for women’s organisation is not shaping up to the rhetoric on the importance of women in development processes. Will aid seriously start flowing towards women, as Justine Greening announced how important the theme is to the future of UK aid? Will philanthropists like the David and Lucille Packard Foundation be the ones who make the difference in funding for women? The true empowerment of women will take radical transformation: both at the level of financial flows to civil society and women’s organisations, and at the level of development vision. We need to halt the empty rhetoric before we lose sight of what words are supposed to mean. And it will take more than speaking up to be heard. It takes bravery to turn up to a development seminar, and, facing the barrage of smiles and nods at the mention of ‘gender empowerment’, make a radical statement that participation is not empowerment. But as much as the development community lacks many resources, I still want to believe that courage is not one of them. Enjoyed the blog? Please leave a comment below – and see our internal discussions and debates on it at the rough notes.